Are iPhone Average Sales Prices Increasing? The most remarkable thing about the iPhone as a technology product is that it has been able to maintain pricing stability for over five years. As the following chart shows, the revenues per unit sold for the iPhone (as reported by the company) have held even as volumes grew exponentially. The latest version of the product should see no significant change in this pattern. I show below the price spectrum of the iPhone as available unlocked in the US (therefore assuming no sales taxes or VAT and no subsidy). 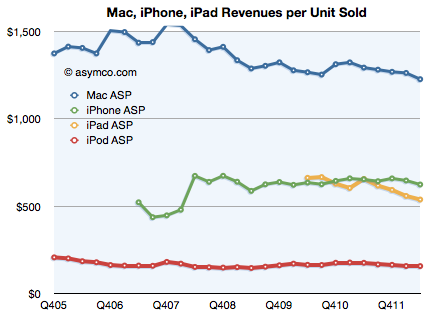 I also highlighted the average revenue per unit from the latest four quarters. The only difference between 2011 and 2012 is that the lowest priced variant is now $450 vs. $375 a year ago. Without knowing the split between products, it’s hard to tell how much impact this price increase will have. Note that the average price was very nearly the same as the 16GB variant ($643 ASP vs. $649 16G pricing). Assuming equal volumes for each variant, the average pricing for 2011 would have been $634. Therefore the actual ASP was only $9 higher than average pricing. If we assume the same for this year (equal split between variants + $10) then the average price could rise to about $660. That would be a slight increase but it would be multiplied by many more phones sold. In fact, going from $634 to $649 and selling 200 million units would imply an additional $3.4 billion in revenue.